Our Giants are preparing to be covered in paint for the next Challenge SGM event which is taking place on Sunday 3rd July. 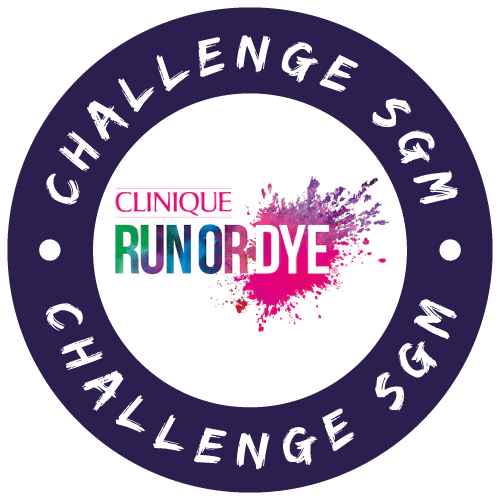 We will be raising money in aid of our national charity of the year Cancer Research UK at this year’s Clinique Run or Dye, which is taking place in the beautiful grounds of Penshurst Place in Tonbridge. 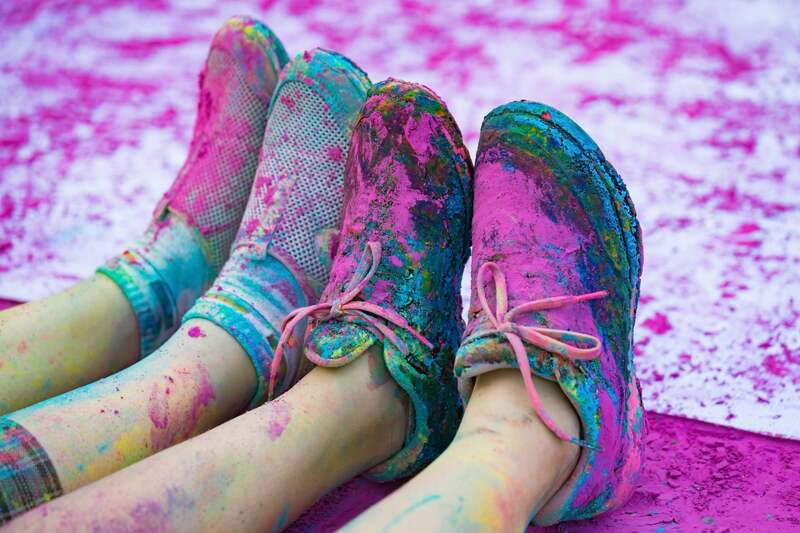 So what is Run or Dye? In short, it is the most colourful 5K run where you go through paint stations along the course and get coloured. We all start out with white shirts to run in, with the aim to get covered in the most amount of paint by the end of the run. We have six of our giants taking part (Holly, Heather, Nell, Lee, Shaun & Ben) and three family and friends of theirs joining them for the run. Alongside us there will be thousands of other runners, including special guests such as Olympic athlete Victoria Pendleton. First – I am not an athletic person. Apart from the odd bout of ping pong, exercise is not my game. I’ll duck out of any form of sporty charity event (I know, shame shame) because it hurts my knees, or my back’s been playing up, or because I have to wash my hair that night. Running is right there at the bottom of the pile in terms of sports I’d consider doing. Second – Who in their right mind wants to get pelted with dried paint?! My thoughts go to the Spanish tomato throwing festival, and let me tell you; it’s not on my bucket list. Both of these sound messy, chaotic, and probably a little bit painful. So why on earth am I taking part? Giant: Do you want to get involved in Run or Dye on the 3rd July? Me: I’d rather do the latter. Giant: Don’t be silly, there’s a bunch of us going and it’s going to be a really great day. It’s for charity! Me: I don’t run, and I don’t like mess. Giant: We don’t HAVE to run! I’m going to walk it, and so are these other people. I’m bringing some friends too! Giant: And it’s not like it stains or anything. They give you a shirt, and it’s basically just a walk through the park. It’s a lovely setting. Me: *Sighs* where is it? And so that was me hooked in. This Sunday, I and many other Giants (and friends and relatives of Giants) will be taking part in “Walk or Dye”, a 5k walk/run in Tunbridge Wells that we’re doing on behalf of Cancer Research UK and Pilgrims Hospice. 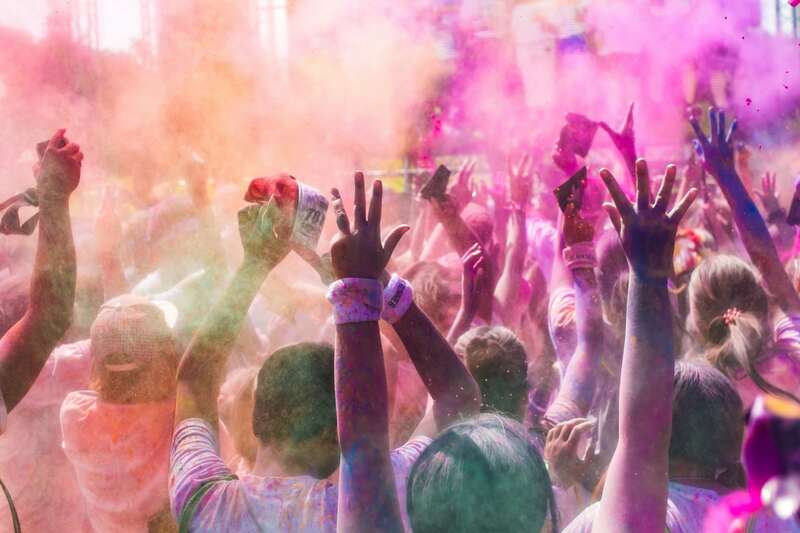 We will be running and walking and getting pelted with colourful paint, doomed to mess up our cars on the way back. Luckily, I’m not one of our designated drivers. Why are we taking part? We’re taking part to raise money for CRUK, which is a charity that has helped and reached so many people. Unfortunately everyone knows someone who has been affected by cancer, and we want to be part of the push to beat cancer sooner. We are so close to our target for CRUK for the year, and we thought this would be a fun and creative way to raise money. To sponsor us, please donate on our Challenge SGM page on JustGiving, and make sure you keep your eyes peeled on our social media channels for a very colourful insight into our team’s efforts!